Baltimore Choirs join in Song! Earlier this Spring new sounds could be heard coming from Anne Arundel County schools in Maryland. “Ode to Singing Buddies” (a mashup of Beyonce’s Single Ladies and Beethoven’s Ode to Joy), “Wade in the Water”, and “Roar” among others. Working with our own, Ms. Alysia, these groups of 2nd-3rd graders are a part of a new partnership in Maryland. In just 5 short weeks they sang, worked on posture and beautiful tone and most importantly, were empowered to grow theirs skills and confidence. On Wednesday, May 10th, Ms. Anne and travel choir members, Jaden, Bridget, Aasia and Maddie took a trip down from Philadelphia and Camden to meet these new singing buddies and join them in song. The Chesapeake Arts Center in Brooklyn Park, MD supported this latest branch out of Sister Cities and made it possible for 3 schools to participate in the choir residency with Ms. Alysia. 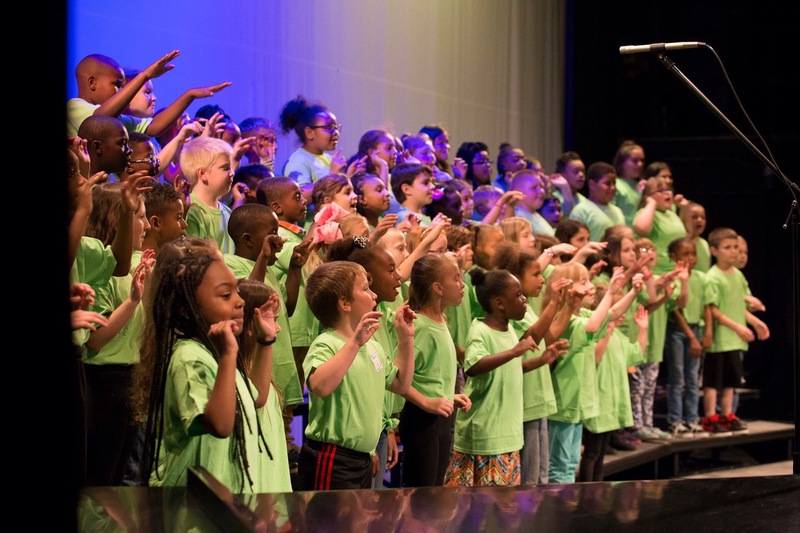 On May 10th, at the Arts Center kids from Brooklyn Park, Elementary, Park elementary and Belle Grove Elementary joined together to present their songs in unity and beautiful singing! Our own travel girls had the opportunity to sing for the kids backstage and to conduct them in singing our favorite “Wade in the Water” as well. To watch the students in rehearsal, and then to listen to their little nerves expressed backstage was something else. But, when they got up there to sing and dance their hearts out the absolute focus and joy they brought was so uplifting for the whole audience. Parents, students and their teachers alike were so proud and excited. We are hopeful this partnership will continue to grow and love that our choir community is expanding and touching more and more hearts! Next Sister Cities takes VEGAS! !